Country: Odilon Redon spent his life in France, growing up in Bordeaux and later living and working in Paris. 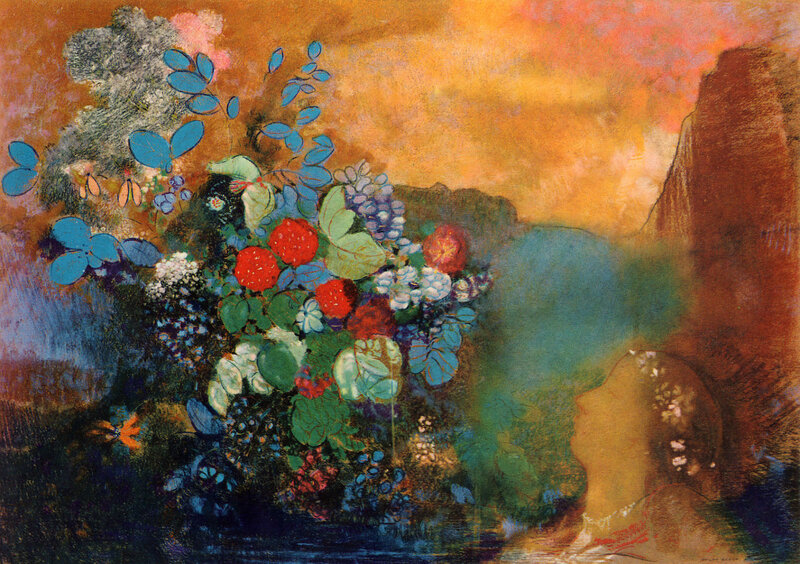 Odilon Redon was part of the Symbolism movement, a European movement at the end of the nineteenth century. Symbolist art is similar to Surrealism in that it doesn’t seem to make any sense. However, there is one big difference between Symbolism and Surrealism: In Surrealism, it’s not supposed to make any sense. But in Symbolism, everything means something. Symbolists had their own visual language. It was an exclusive group. Symbolist writers and artists would gather together in bars and coffee shops, and Symbolist artists would illustrate Symbolist writers’ books. These groups drew upon cultural knowledge that educated people in their social circles would be familiar with: literature, mythology, poetry and science. Symbolist artworks would often only be readable by other Symbolists. 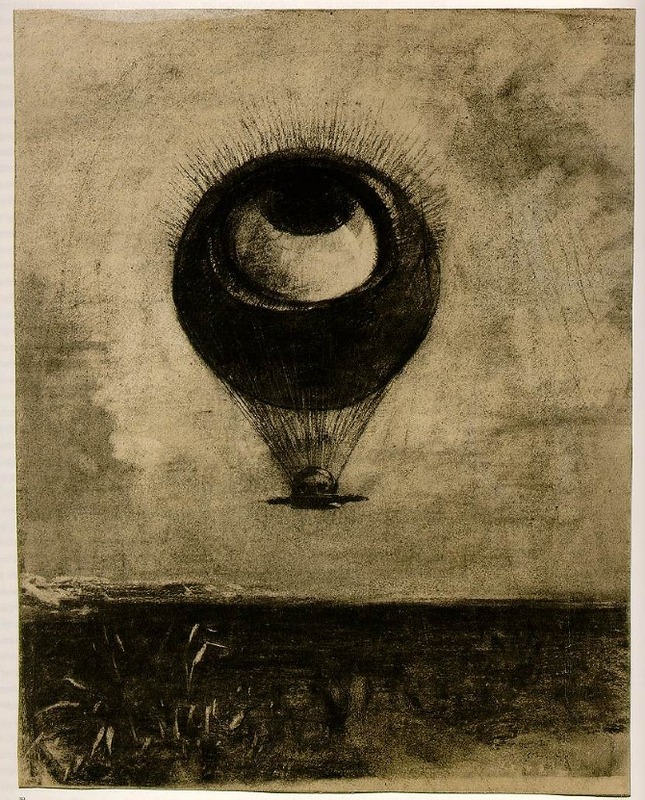 Odilon Redon also drew upon these sources. In his early years he was inspired by literature such as Edgar Allan Poe and Charles Baudelaire. His work was quite dark and throughout most of his career he didn’t use colour at all. His first collection of works was called “Noirs”, consisting of a set of charcoal drawings. In his mid-40s Redon’s work was championed by a group of Symbolist French writers and artists called the Decadents. They saw in his art an identification with their own ideals of sensualism, moral disobedience, and individual imagination. Decadent writer Joris-Karl Huysmans published a famous book called À Rebours (“Against the Grain”), in which an aristocrat, who despises the 19th century French bourgeoisie and wishes to withdraw into an his own artistic world, hangs works by Odilon Redon on his walls before his death. 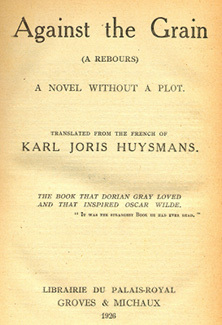 The first English translation of À Rebours from 1926. In his late artistic career Redon did a complete 180 and started using amazingly bright colours in his art, working mostly with pastel. These remain his most famous works and he kept using this style until his death in 1916. While most Symbolists hung out and worked together, Redon was never truly part of these social circles. He was always sort of an outsider. He was born into a prosperous family and received lessons in art from an early age, but did not really have a happy childhood. As a young boy he was very sickly, so his family decided to put him under the care of his uncle at the estate of Peyrelebade. He was very lonely at Peyrelebade, and his time there greatly influenced his art, as he would spend hours daydreaming and reading. Many art historians believe that the darkness of his early work directly stems from the loneliness, anxiety and depression that he experienced at Peyrelebade. This is an example of an image that looks like complete nonsense, but is meant to be interpreted symbolically. The sky represents freedom, with the giant eye gazing up at it and moving away from the desolate landscape. Hot-air balloons were very fashionable at the time. This image was inspired by Baudelaire, who described hot-air balloons as “the monster balloon of perfectibility and infinite progress”. 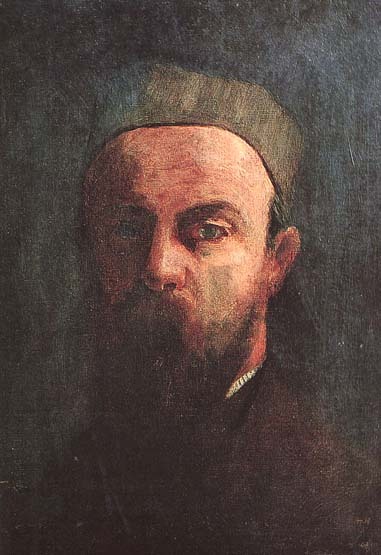 Odilon Redon actually exhibited in the 1886 Impressionist exhibition. In this drawing, the sea at the bottom of the image looks almost like a pencil version of Monet or Renoir, with a picturesque sailing boat and seagulls. The giant head, however, dominates the image, with enormous eyes and a tiny wing keeping it suspended. It evokes both loneliness and calm. 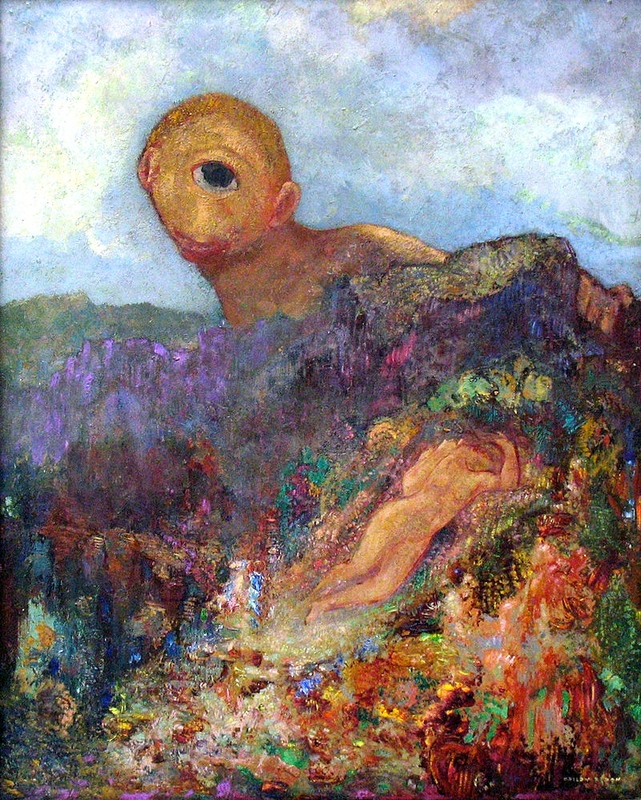 Like many other Symbolist paintings, The Cyclops takes its inspiration from Greek mythology. It shows the cyclops Polyphemus looking at Galatea, the naiad he was in love with. Polyphemus is usually painted as a dangerous brute, but here Redon depicts him in a gentler and more passive way. The shapes of Galatea and Polyphemus both evoke genitalia. 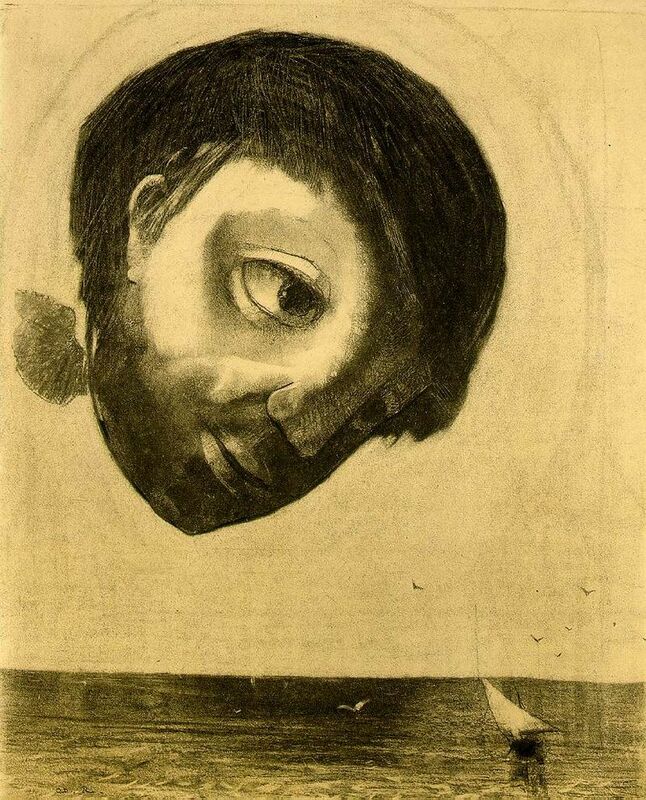 This is one of a few Hamlet-inspired artworks that Redon created during this period. Ophelia was a popular subject for European painters around this time, often showing her drowning in a river surrounded by flowers. This theme would have been immediately recognizable to Redon’s audience. 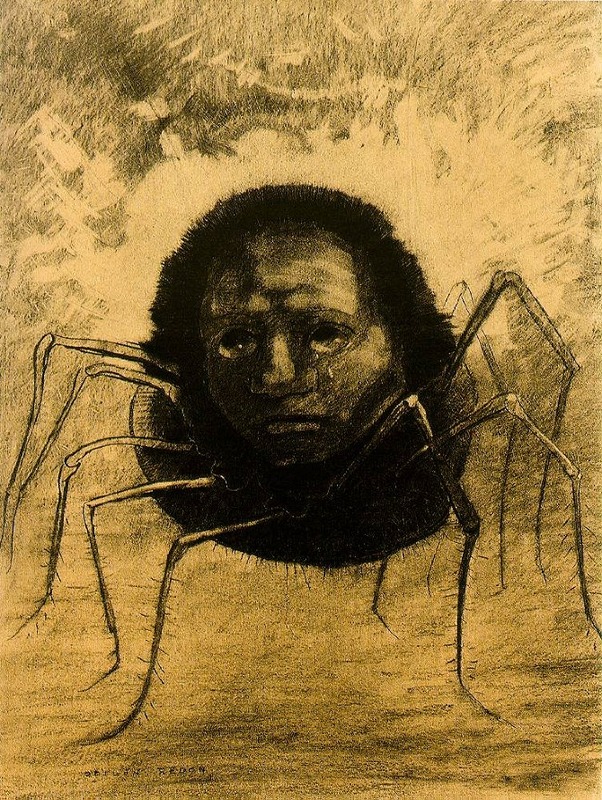 I am the First Consciousness of Chaos: The Black Album by Odilon Redon – a recently released collection of his “noirs” with excerpts from the texts that inspired them.